Completely Renovated 3BR/2BA With 6 Beds and Hot Tub! Great Outdoor Space! Located In A Quiet Cul-De-Sac And Close To Everything In Nashville. This 3 bed, 2 bath home was just completely renovated from top to bottom. It sleeps up to 10 and has a beautiful outside gathering area and a hot tub. Nothing in Nashville is more than a short drive away. The master bedroom has a queen bed. Bedroom #2 has a queen as well. Bedroom # 3 has 2 adult size bunks so that room sleeps 4. The home also has Direc TV, WiFi, and a full kitchen with all brand new appliances and Keurig. Washer and dryer are on property as well. The house is catered for large groups, families, and bachelor/ette parties. We'd love to host your group! I work for Southwest Airlines full time. And you know you love the people of Southwest, right? This home is one of a couple properties that I own with my cousin and my wife. We love hosting guests and giving them the full Nashville experience! I bought this particular home because it is in an up and coming area of Nashville. It's close to just about everything, yet just far enough away from downtown to be nice and peaceful. 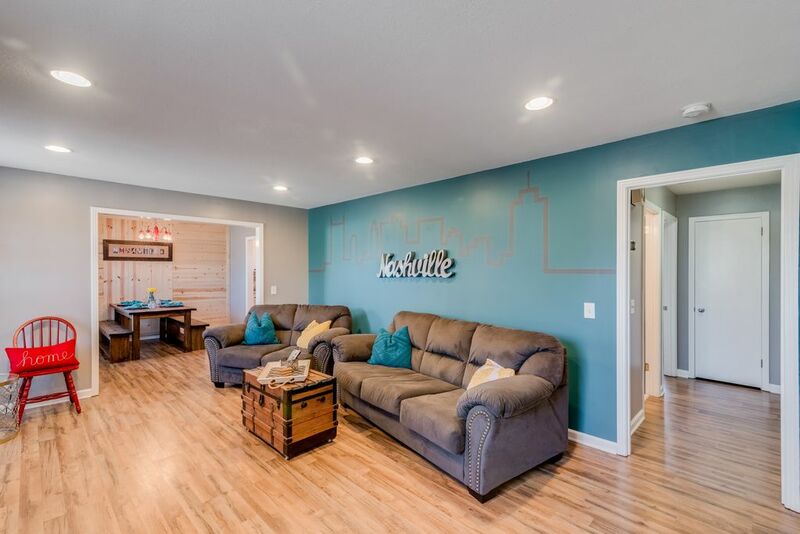 This home has been completely renovated and it is Nashville through and through. The inside is configured to sleep up to 10 guests and the back deck area is our pride and joy. With a covered are that has a beer-garden like atmosphere that leads to an open air deck with a hot tub overlooking a quiet, wooded yard. It's the perfect place to relax after a long day seeing the sights, or a place to get ready for your night on the town. Speaker supports Bluetooth or AUX plug in. My boat is in a private slip about 2 miles away. It may be available for rent. Inquire for details. Our stay was great! Lots of room outside (would be great if you were bringing kids) and the hottub was an awesome plus! Rooms and bathrooms were great size! Thank you for letting us stay in your home. We loved it, thank you! Overall, our experience at this house was really fun. There was enough room for 10 of us (bachelorette party) and we spent some time in the hot tub and outside porch. The location to downtown was perfect for us and it is so close. The cost for our Uber was very affordable. The only one downfall was that the house is pretty close to the neighbors and we were a little loud when we were outside playing a competitive game which upset some neighbors. House was very well kept, had everything we needed for the entirety of our stay including cookware and a nice grill so we didn't have to eat out every night. Very short drive to downtown and surrounding areas with lots of cheap options for rides if you don't wish to drive. The house is great, had so much fun in Nashville. Property is well maintained and very welcoming! Our home is located about 4 miles from the Nashville airport, 15 mins from downtown Nashville and 1 mile from Percy Priest Lake.